Ohhh myyy....owls, owls, owls....love, love, love them. Take a look at Tricia-Rennea Art and all the owls freebies she has.....what a hoot I had. Not only does she have owls but lots of other things that you will love to grab. Tennessee Ridge offers free prim patterns but each month she takes the old one down and puts up a new one. So keep checking. Imagine Fabric has a tutorial for an easy tote bag.....I have made many a tote bag and these instructions are very easy for your first tote bag. This is a cute little purse that would be good to teach our little girls to make. Paper and Strings gives you a pattern for a cupcake/ice-cream applique to put onto a purse. For all the Pug Dog lovers....this really is an adorable stitchery. I just typed in "free patterns" in the photo storage site FLICKR. You would be surprised how many came up. So take a look girls and see what you can find. Let me know if you find something you love as I haven't got all the time in the world to look at each and every one...but slowly does it...I will get there eventually. Just thought it worth mentioning. OMG I just spotted a cute crocheted owl over at Roxycraft....who wants to make me one. I hear you all saying "me, me"....LOL....its soo cuhoot.....Woody the Owl can come live here any day. There is also a main list of freebies to grab here. This is so cute. 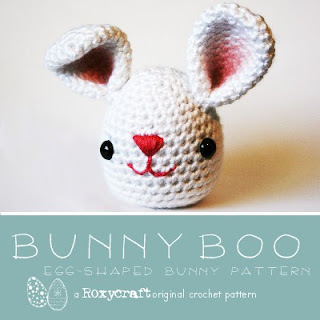 If you can crochet this is a cute little bunny....drop over to Roxycraft and whip one up. Who doesn't love a Love Bug? Pimp Stitch has a ladybug stitchery to grab if you do. I just stumbled on some stitchery patterns on Flickr. They can be downloaded here if you are looking for a circus theme or some cute Terrier Chore duties for you tea-towels. I haven't seen these ones before. Linda lum deBono has two cute quilts, a cute Christmas tree applique/stitchery pattern to grab. 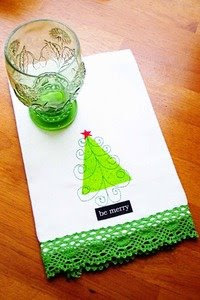 I like how she did the tree with applique and stitchery on the tea-towel. Artsy Crafty Babe has a PDF pattern to download here for a Pleated Tote Bag. She also has a really cute bag called Phoebe which I think I will have to definitely make. 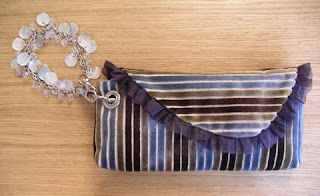 I just found another wristlet purse over at U-handblog to make without using a zipper. This a cute way to add a bracelet to the purse to give it a bit more bling factor. 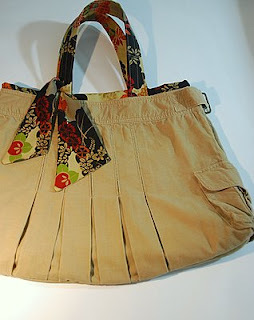 Lisa also has a lined grocery bag that can be folded up into a little clutch with a handle you can clip onto a wristlet. Whip Up has a great idea to recycle those unwanted mini skirts. Not that I own one but the 2nd hand shop may have some to make this nifty looking bag.....a clever idea like the jeans bags that are used from recycled jeans. DIY Bag Lover has really cute way of making a cosmetic purse, especially if you don't like putting zippers in. 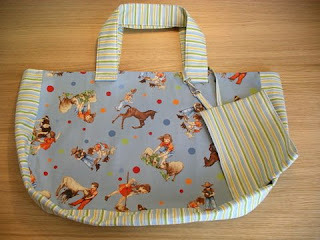 She also has a tutorial for a raggy tote bag....should be easy to make following the tutorial. Spool has some tutorials for several things but I do like the wristlet she has to make. There are a couple of things made out of place-mats. Good way to re-purpose those place-mats you haven't been using. She has got all her tutorials in easy PDF form too which makes them great to download and save for a later day. The Noble Wife has a few different stitcheries and also a tote bag and quilt pattern to grab. I love the tote stitchery. Posie Gets Cozy has some cute stitcheries you could use on your teatowels with a cute kitchen theme. 4 Crazy Kings has a cute tutorial for clay owls....these are so cute...just gotta love owls....and they do look easy...although saying it and doing it are two different things for me...LOL...but I am really going to have to try these. Another great blog for free backgrounds is One Cute Blog. Now it was funny that I have come across this tutorial for a shower cap as I was just thinking yesterday I would make one up without a pattern...but here you go....a tutorial pops up over at Sew Delish. Sue Daley Designs has a lovely thread catcher to make...I myself think this is a great basket for all sorts of bits and bobs. Some more cute backgrounds for your blog can be found over at My One Cute Blog. Okay who wants to make owl buttons? The Clay Store have a tutorial which looks easy...but....I have never tried making anything like with polymer clay and am a bit chicken to start....or should I say owly.....but I would love some...they would be so cooowwwlll....hoot, hoot!! The Cottage At Frog Creek has a cute owl applique which she has put on a girls skirt....but you could put it on a lot of things. 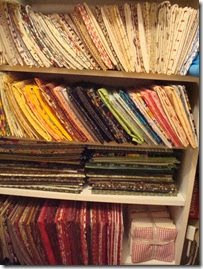 Another source for some lovely backgrounds can be found over at Ivy's. I know I can't help myself with the backgrounds. I love changing them often. There are so many terrific backgrounds I can't resist. 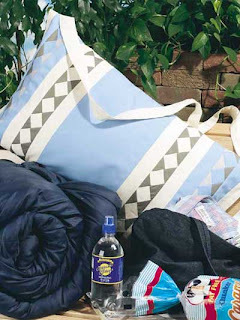 Free Quilting has a pattern you can make a travelers pillow bag...now I love this idea...when hubby and I travelled to the States for 3 months I took my own pillow..I just sleep better with my own pillow...I didn't even think to make a bag for it...I had to cart it under my arm. This is a great idea.....stitch a greeting card. Prick and Stitch Is My Craft has some stitchery and instructions on how to make greeting cards using a simple stitchery for the front of the card. This sounds simple enough and would make a lovely change from the norm. 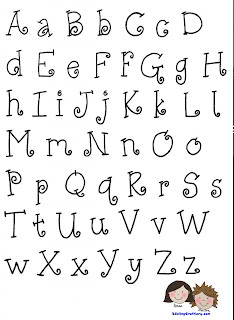 Renee of Sibling Craftery has a alphabet for you to use in your stitchery and embroidery work. Go grab it and personalise your craft projects. Ohh and go HERE for a list of her freebies list....there are some OWLS there too....hoot hoot~!! 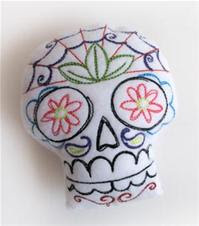 aghhhhh me matey's.....for all you pirate and skull lovers out there...Urban Threads have a skull stitchery you can grab and turn into a pincushion. 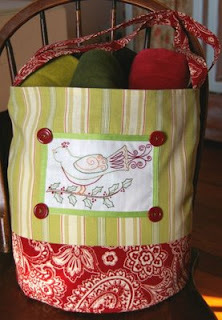 Lurline's Place has a nice tutorial on how to make a drawstring dilly bag....jump on over and have a look. 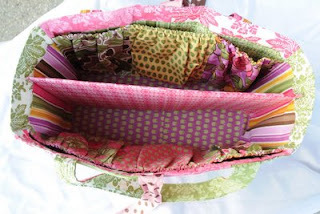 Lazy Girl Designs has a free pattern for a little satchel type bag called Sew Sweet Satchel. There is also a tote bag, hospital gown and yo-yo tutorial. Polka Dot Pineapple has a quick cute bookmark tutorial to snap up. You could whip these up real quick. She also has a cute floral pin/brooch tutorial to follow and make up a few brooches. A quilt as you go method that might help us who struggle with the huge quilts on a domestic sewing machine. Julia's Place as a tutorial that might interest you. Marie-Jolie over at Permission to Unwind has a tutorial to make a cute strawberry scissor fob here. Make It and Love It has a nifty idea to jazz up some beads and make a cute bracelet or necklace with fabric covered beads....you could even make bag handles for your totes/bags....hey I can see some cute owl fabric used to make myself a cute bracelet. Yes another Owl.....but it is sooo cahoote....come on, you cant say you don't just want to whip one up right now...and while you're at it make two and send one to me...hehehehe...fly over to Mels Own Place and grab the tutorial. 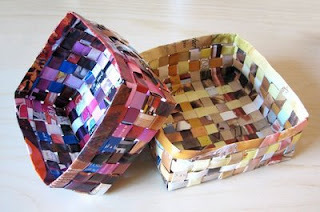 Another great fabric bowl idea....another one I will have to try. Here is a picture of one that Talin has made. Q.D. Patooties has a heap of different softies to make up for free. Go take a look. She has an owl too...hoot, hoot!!! Hot Diggity Dog is a cutie and also Wimbley the Anime Bear. Another great blog offering free backgrounds is My Blog Makeover. Jump over for and grab a new background. Wee Folk Art have a cute owl book mark you could whip up quite easily....take a look he is so cute. Take a look at her cute owl doorstop too. You will also find some free applique patterns here. 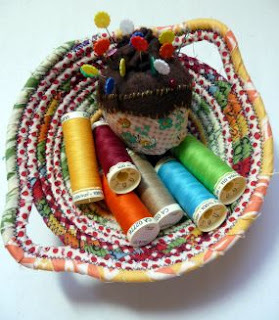 You have to jump over to Nutmeg Designs and take a look at this cute tutorial to make a pretty purse pincushion....every girl needs one of these.